Gigi Hadid can’t get enough of Zayn Malik. Seriously, the girl is so into her man that she couldn’t keep her eyes off him, or her screensaver image of him that is, while being prepped for the VS show! 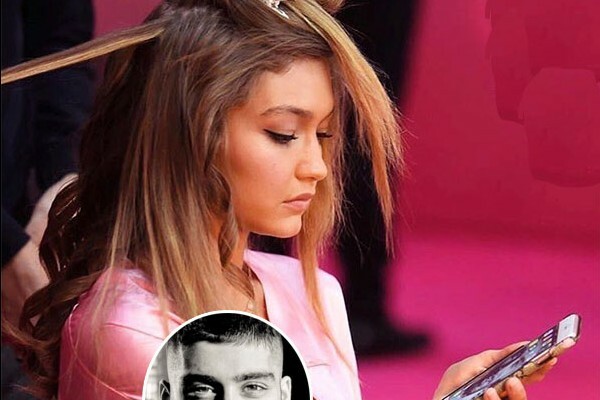 Check out the pic of Gigi looking longingly at the image of Zayn on her phone here! Gigi Hadid, 21, and Zayn Malik, 23, are definitely relationship goals. And that was completely evident when the model was caught gazing adoringly at her screensaver while getting ready for the Victoria’s Secret Fashion Show on Nov. 30. Why was it such a sweet moment? Because Gigi’s screensaver is a pic of Zayn of course! The model was sitting in a chair getting her gorgeous hair curled to perfection when a pic was snapped of her looking at the shot of her love she keeps on her phone’s home screen. You can see that Gigi’s looking quite intensely at the pic of Zayn, and we can totally understand why. He’s a hottie and totally head-over-heels for her. And he’s been so supportive of her modeling career and her role in the Victoria’s Secret Fashion Show! Gigi probably wanted to think of him before heading out on the catwalk to help calm her jitters. We certainly would! But even if Gigi headed out feeling confident, she still suffered a slightly embarrassing wardrobe malfunction halfway through her travel down the catwalk. Ya, a strap from her lingerie (right under her left breast) snapped off and fell toward her belly button while she was headed down the runway. But thank God her breasts stayed covered by the rest of the lingerie. And Gigi just kept walking, not letting it affect her at all! Maybe looking at Zayn right before the show really did help!